Had fantastic conditions for 2015’s first charter. We were treated to warmer than expected temperatures and glassy calm water. Big schools of redfish cruised up and down the banks sometimes exposing their backs at low tide. The reds happily ate cut mullet and mud minnows fished on the bottom with circle hooks. 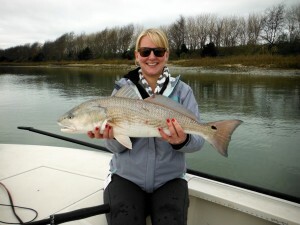 By the end of the day, we not only had the first redfish of the year but also Michal’s biggest fish ever!